In Jennifer Barnes stunning novel, The Fixer, sixteen-year-old Tess Kendrick isn’t like most girls. Most girls don’t get whisked away to live in Washington D.C. with a sister, Ivy, who you haven’t seen in three years. Most girls don’t have a sister that is known as D.C.’s number one “fixer”-- the person who D.C.’s elite visit to have their problems disappear. And most girls don’t find Ivy’s and their own world colliding when a conspiracy and a murder affects both your school and Capital Hill. Readers will appreciate how Barnes spins the narrative toward a concluding plot. Barnes’ last line is riveting and will leave readers itching read her sequel, The Long Game. Barnes choice to craft the novel in a first person narrative voice is smart. This viewpoint lets readers in Tess’ head and helps feel Tess’ joy, amusement, annoyance, pain, grief, anger, and internal struggle as she faces her problems and family. Barnes’ visuals were amazing and helped with plausibility. Readers can see Tess’ room, Ivy’s house, Hardwicke Academy, the warehouse, and more. One theme Barnes explores is murder is never justified. Barnes shows politics, power, nomination, money, and love can corrupt a person. She firmly demonstrates that we shouldn’t take another person’s life no matter the cause. Barnes develops Tess as a main character throughout the novel. Gradually, Tess accepts that Ivy is her family, thanks to help from secondary characters Adam, Henry, Vivvie, and Bodie. They show Tess that people change, have to do things for all sorts of reasons, and you shouldn’t abandon family. Barnes fills readers heads with questions that will keep readers turning the pages. Readers will be asking themselves: Is Tess the new “fixer?” Why did Ivy leave Tess for all those years? Who is behind the conspiracy? Is Ivy going to meet Kostas request? Who is the killer and what is his/her motive? Barnes’s thriller is definitely worth readers’ time and money. 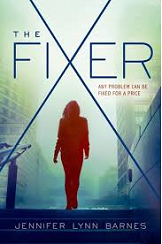 The Fixer is a perfect for young adults who love thrillers, tons of twist, and a plot that involves government, politics, and discovering who the killer is. If you want a story that you can’t put down and will keep you on the edge of your seat, pick up a copy of Jennifer Barnes, The Fixer.